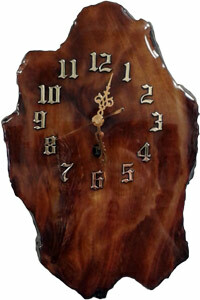 Kauri Clocks New Zealand Gifts. This clock is 37cm high by 25cm wide. It weighs 1.5kg and is a wall hanging clock. It uses one standard AA battery. 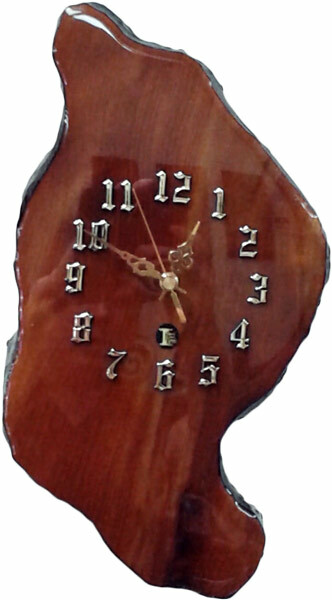 This clock is 37cm high by 24cm wide. It weighs 1kg and is a wall hanging clock. It uses one standard AA battery. 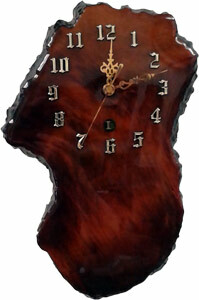 This clock is 38cm high by 20cm wide. It weighs 1.2kg and is a wall hanging clock. It uses one standard AA battery. The giant Kauri tree is the most famous New Zealand native timber and one of the largest trees found anywhere in the world. Growing Kauri trees have been found as old as 4000 years with heights up to 150 feet and girth to 60 feet. Today New Zealand legislation prohibits the felling of any growing Kauri tree. Thousands of years ago a huge natural disaster caused many Kauri forests to be flattened and the trees to be buried in swamps. The wood was perfectly preserved and radiocarbon dating has revealed that some of this wood has been buried for up to 50,000 years. The clocks have been scientifically prepared using the natural shape of the wood, which of course makes each clock unique and no two can be the same.